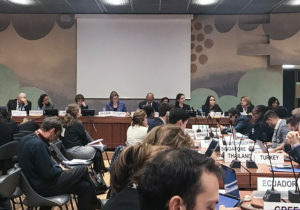 Urban displacement appears to be taking an increasingly strong foothold in Geneva: after the launch of ICRC’s study on “Displaced in cities” and of IRC’s report on “Urban refuge”, as well as the endorsement of the Global Compact on Refugees end 2018, the 2018 High Commissioner’s Dialogue focused exclusively on urban displacement with its theme “Protection and solutions in urban settings: engaging with cities”. Alongside these events, the Global Alliance for Urban Crises continued its work by holding consultations with its members to get final input on its knowledge products ahead of their launch on February 8th, 2019. The growing attention brought to improving responses in urban displacement contexts is no surprise to JIPS: on the one hand, most of the world’s forcibly displaced people – both refugees and IDPs – currently live in urban areas. On the other, urban displacement usually present highly complex situations, and finding solutions for displaced persons and host communities requires analysis of both people and the places in which they live. “We have heard these things for many years, but with the establishment of the Global Compact (of Refugees) we have now a more solid framework within which to discuss these issues, with more institutional and political commitment to make this succeed.” (High Commissioner in his closing remarks). What did we learn from the High Commissioner’s Dialogue? More than 600 participants from diverse sectors joined the 11th High Commissioner’s Dialogue event and contributed unique insights to the debate. Building on the Global Compact, their underlying message was clear: for comprehensive, timely and adequate responses to urban displacement we need to work together with a wide range of stakeholders. In particular, cities with their local authorities and city administrations have a leadership role to play as they are not only the first responders to a crisis situation but also in charge of longer-term development of the city itself and the wellbeing of its populations. Nonetheless, acknowledging the key role that local authorities play is often not enough to enable effective collaboration and coordination between them and the humanitarian and development sector. This is particularly true in complex urban settings where the needs and priorities for all these actors may be very different in terms of urgency, capacity and scope. In this respect, this event succeeded in bringing to the forefront the voices of local stakeholders that have been responding to urban displacement in their local contexts: to share not only the complexity of challenges that they face but also the successful approaches to collaboration that has enabled them to take a leadership role, build strong partnerships with humanitarian and development actors, and enhance their planning and response to displacement in their local contexts. Several of them highlighted the relevance and use of urban profiling exercises supported by JIPS in the past, including the Hon. Mr. Abdirahman Omar Osman, Mayor of Mogadishu, Somalia. The leadership of the Banadir Regional Administration in the decision-making and implementation of the profiling exercise of IDPs living in informal settlements in Mogadishu in 2016 enabled the incorporation of IDPs into the city’s urban development plans. This evidence base continues to be used for the support of durable solutions today. The Governor of Erbil in the Kurdistan Regional Government, Iraq, Mr. Nawzad Hadi, had a similar experience in the continued use of the results of the 2016 profiling exercise there, where the local government organisation Erbil Refugee Council led the liaising with other government ministries to produce more tailored responses that considered the needs of the host communities, the IDPs and the Syrian refugees seeking refuge in Erbil’s urban areas. From a different perspective, the Deputy Humanitarian Coordinator for Darfur, Ms. Amy Martin, shared the experience of an ongoing urban profiling exercise, also supported by JIPS, to inform durable solutions for internally displaced communities in North Darfur, many of them living in long-standing camps that have now become part of larger urban areas. At the centre of this initiative, based in El Fasher, North Darfur, is a multi-stakeholder collaboration bringing together different levels of government (national, federal and local), the international community and the affected populations, who were part of the development of the methodology including the selection of indicators and the data collection and analysis. With early recovery and peace-building at the top of the agenda in Sudan, this collaboration was fundamental to establish a sound and agreed-upon evidence base that ensures that responses successfully address the remaining protection and humanitarian needs in the IDP camps, the development challenges in El Fasher and the wider region, and the peace-building priorities at regional and national level. All these examples demonstrate how strong and agreed-upon evidence can be an entry point for better collaboration, particularly with local authorities, and enable localised planning and coordinated efforts in urban areas. What is needed to better tailor urban responses? UNHCR specifically highlights urban profiling as an important first step by creating a robust evidence base and “quality, comprehensive analysis”. As participants reiterated during the discussions, in order to have evidence that we can all agree on, we need to invest in fostering a shared understanding of a displacement situation to establish the foundation for more complementary and collaborative responses. This defines urban profiling as: “a collaborative process for collecting and analysing data on the conditions of an urban area and its neighbourhoods, the systems that organise them, and the needs, vulnerabilities and capacities of the population groups that reside in them, to inform decision-making and planning before, during or after a crisis situation”. Read more about urban profiling here, and come to our launch event to hear JIPS’ coordinator Natalia Baal discuss challenges for data collection in displacement-affected cities and how collaborative profiling processes can help to overcome them. We often hear that displaced populations flee to cities because that is where they expect to find jobs and services. But the profiling exercises we have supported in cities show a more nuanced picture: some displaced people find the support they need while others are forced to live under the radar, in some cases becoming more vulnerable over time as they pay rents far above their means or face eviction risk. In other words, cities are incredibly diverse, and the opportunities and services they offer are not always available to everyone. How do you know whether a city is able to meet the needs of its populations? What is the city currently able to provide to those internally displaced, who often must settle in informal or unplanned parts of the city? These are just some of the questions we are grappling with as we develop new approaches to analysing displacement in cities. Constantly striving to improve our practices in JIPS, we are developing an Urban Functionality Index in collaboration with partners to make analysis more systematic in displacement-affected cities. We will use this index for cities in Syria and Yemen. To share our experience from profiling in urban areas, we have documented our lessons learned in an upcoming background paper in the 2019 Global Report on Internal Displacement, expected to be released in May. We will design and test new approaches to responding to displacement in cities in 2019 through profiling exercises in cities in contexts as diverse as Ukraine, Sudan, Afghanistan and Libya. We will keep our pulse on the global discussions through continued engagement with the Global Alliance for Urban Crises. Its diverse membership – from local government, humanitarian, development, built environment, civil society, and academia, who all have complementary roles to play in urban crisis response – reflects the collaboration we want to see in the field. Learning from the many different perspectives and expertise it brings together will collectively improve the way we inform and tackle urban crises in the future.